Wood columns and pillars can add a touch of class and style to any interior or exterior spaces. Custom columns are available in many different sizes and styles, allowing for multiple functional and decorative uses. Because of the many wood species architectural columns and pillars can be made of, you can get a decorative flair that enhances your existing wood elements. Just because wood columns replicate classical designs of ancient Greece and Rome doesn’t mean they can’t be a welcome addition to your modern home. Tapered smooth plain columns, for instance, can create divisions and new focal points in a larger living room or dining area without disrupting the view or flow of traffic. If you prefer something that’s more decorative, straight roped columns can create a classic look and feel in a piano room, bedroom, entryway, or doorway. For functional purposes, well-constructed interior columns can be used to support arches, mantels, or even kitchen or bathroom cabinets. A home doesn’t have to be the Roman Coliseum or a sprawling mansion to benefit from perfectly placed exterior columns. As with interior designs, outside columns can provide structural support. Without outside columns and pillars, the support is usually for a porch, doorway, or a covered deck. If you prefer a touch of elegance for your exterior spaces, you might consider straight or tapered fluted columns.. Maintenance doesn’t have to be a problem either since special coatings can be applied to wood to provide added protection against the elements, insects, and general wear. In every kitchen, there is always a need to add creative features. 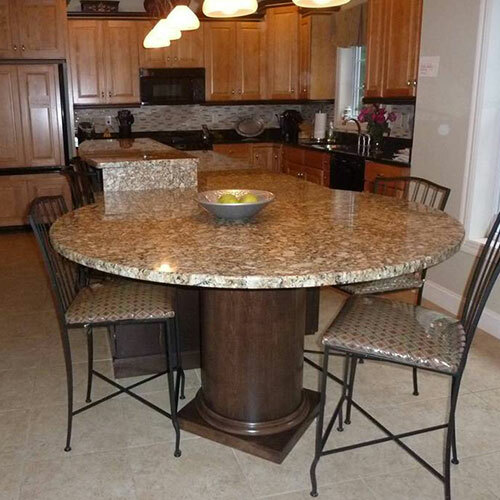 If you have the opportunity to design your own island or table pedestal, you don’t have to settle for just the standard. Wooden island legs and pedestals can be custom-designed in styles that can be as subtle or dramatic as you prefer. Quality custom wood turnings from trusted manufacturers like Turntech can be a smart, affordable investment. What’s even more appealing is the ability to simply paint or stain your columns, pillars, table pedestals and kitchen island legs if you want to update your style or refresh colors and patterns you already like.